If you initiate a transaction by buying, then you are going long in the quote currency and short on the base currency. If you initiate an order by selling the currency, then you are going short the quote currency and long on the base currency. Therefore, perforce, if you are long in 1 currency, you must be short in the other. To close a position, you must reverse the transaction that opened your position: selling the currency you bought, or buying the currency you sold short. Most, if not all, brokers provide for basic order types that are similar to orders for stocks. The most common order is the market order, which is to buy or sell at market. Actually, what this means is that you are buying the quote currency at the brokers ask price or you are selling short at the brokers bid price, which is always lower than the ask price. This is how most brokers make their money, and why they do not need to charge commissions. The spread is the difference between the bid and ask prices. In most cases, the most actively traded pairs will have the smallest spreads, and less actively traded currency pairs will have larger spreads. Spreads also increase when there is increased volatility in the market, even for frequently traded currency pairs. As soon as you buy or sell short, the spread is immediately subtracted from your equity, because if you immediately closed the transaction even before there are any price changes, then you will lose the amount of the spread. The problem with the over the counter (OTC) market is that there is no market price that is the same for all brokers, because there is no central exchange where bid/ask prices can be compared. Most brokers average the quotes from several large banks, but these quotes can differ depending on the bank. The forex dealer then widens the spread for their own profit. This is the "market price" that your broker quotes. This is true even for those brokerages that are advertising a no-dealing desk, where your quote, supposedly, is seen directly by the participating banks. However, the forex dealer is still widening the spread, for that is how brokers make their profits. Another problem with market orders is that some dealers may give a trader a very unfavorable price that could be 10 pips or more removed from what the trader could see using the broker's software, and then see the price go right back to where it was. Sometimes, the broker will even requote the price, giving you a different price from what you thought you bought it at. This doesn't happen often, but if it does, you should find another broker. An entry limit order is an order for a currency pair that is away from your broker’s bid/ask price. In other words, your limit order to buy is not your broker’s ask price, or your order to sell is not your broker’s bid price. Your order does not compete with any other orders. Only your broker sees your order—no one else. So there is little point in trying to place an order inside the spread, where the transaction price—either a buy or a sell—is between the bid/ask price. Many trading platforms do not even allow such an order to be entered, but even if they did, the broker probably won’t complete the transaction unless the market moves enough in the direction of your order. There are some forex brokers who are advertising a no dealing desk, where your order is shown to some banks that are in the broker’s network, and, in these cases, the trading platform does allow you to place an entry limit order inside the spread, but even this is not really effective, because only a few big banks see your order, and if it is a small order, they probably won’t have much interest. This is in contrast to an American stock exchange, where the best bid/ask prices from all participants is displayed in the system, allowing just about anybody to see those stock prices. There is another type of limit order that closes a transaction—the closing limit order—and, often, it is listed simply as a limit order by the trading platform, but this is an order to close a transaction that has already been initiated. If the initial transaction was a buy, then the closing limit order will be a sell, and vice versa. It is not necessary to specify whether to buy or sell, since this will be determined by the initial transaction. It is only necessary to specify the price. Closing limit orders are set to take profits, so if the quote currency was purchased, then the limit order will be higher than the purchase price; if the quote currency was sold, then the limit order will be less than the sale price. If the broker’s relevant bid or ask price never reaches your limit order, then no transaction will be triggered, and your position will remain open until you change the limit price or change it to a market order. It is very difficult to predict currency prices or monitor a 24-hour market, and so brokers offer the stop-loss order type as a way for traders to prevent major losses by being able to set a limit at an unfavorable price to close an open position before the losses become too great. Because stop-loss orders are placed to prevent more losses, they are set on the other side of the limit order to take profits. Thus, a stop-loss order for a purchase transaction to sell is set below the purchase price, and a stop-loss order to buy for a short transaction is set above the sell price. Because of the spread, a stop-loss order for a purchase transaction must be placed below the dealer’s bid quote, which is lower than your purchase price at the time of the transaction. In fact, it should be placed low enough so that the random walk of market prices will not trigger your stop-loss order before your limit order. Many traders try to avoid this by not setting a stop-loss order, but this is a mistake. The market could move counter to your expectations for a long time or by a large amount, resulting in very large losses, which are magnified by whatever leverage you are using. Since currency prices are so unpredictable, it is wise, and most trading platforms allow it, to set both limit and stop-loss orders with the initial order, whether it be a market or an entry limit order. The way to actually trade with most forex brokers is over the Internet using their software—the trading platform. The mechanics of trading and what currency pairs you may trade is determined by the software. In addition to trades, the software usually provides other information about your account, such as your balance, how much margin you have used, and how much you have left. It shows all open positions along with any stops or limits for those orders, and any entry limit orders to initiate a transaction. The software may also have windows for news and messages, and may provide a chat service so that you can get help. 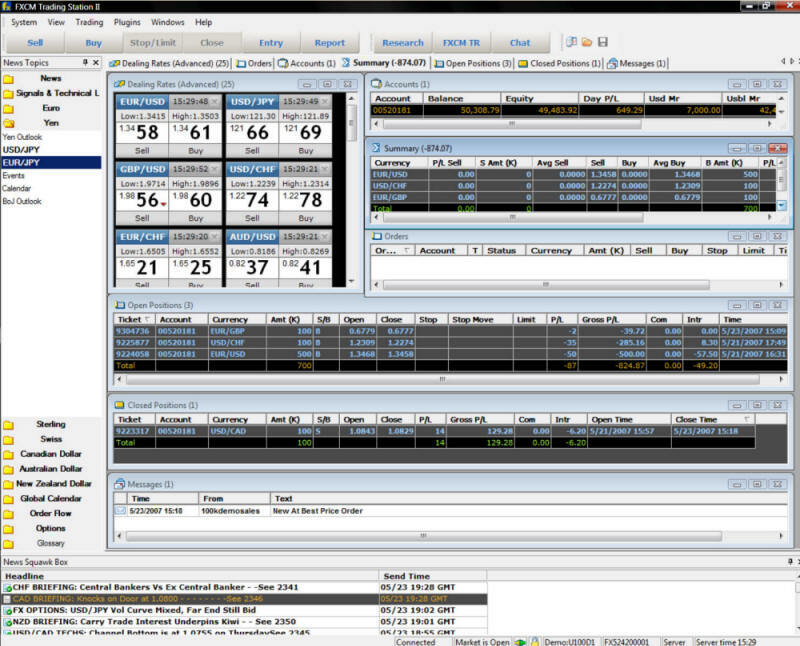 The best way to learn the software is to use it to manage a practice account, where the broker allows you to trade using real market data, but without using real money. Good software should prevent you from making at least some mistakes, such as accidently entering a buy price that is higher than the market price, for instance, with similar constraints in setting limit and stop orders. Otherwise, mistyping something, or misusing the software can be a costly mistake. In the stock market, you can set time limits on orders, such as good till canceled (GTC), or day orders, which are good for the day. However, because the forex market is a 24-hour market from Sunday afternoon until Friday afternoon, most orders placed with brokers are GTC orders. Before you start trading with real money, you should practice with a practice account first. This is the best way to ensure that you not only understand the trading platform, but also understand forex transactions. Otherwise, you could end up with large losses. You should also trade long enough to see how well you do. Don’t jump into it just because you did so well with a practice account in your 1st week. You were probably just lucky. Although forex is very popular nowadays, and there is a great deal of advertising promoting it, the fact is, it is very difficult to make money trading currency—unless you’re a broker!